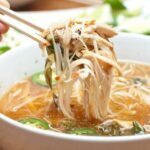 Chicken Pho made easily at home in your Crock Pot! I will repeat: Crock Pot Chicken Pho. I know. And you’re welcome. Ok, I’m in no way saying that this phở is anywhere near the phở that the tiny little Vietnamese woman at Toast N’Phở makes (my favorite pho in Portland), but it’s close. Damn close. Mainly because we made it ourselves. In our Crock Pot. While we were at work. WIN. The secret to an amazing phở is definitely the broth. That’s why I had made a deliciously rich, fresh chicken stock the night before. Then, all it needed were the pho flavor goodness: fresh ginger, star anise, whole cloves, brown sugar, fish sauce, and cinnamon. Mmmm, fresh, from scratch chicken stock. But a really good prepackaged stock would work just as well. and finally a whole cinnamon stick. and poured the stock and spices over the chicken. Done. Left for 10 hours on low in the Crock Pot while we go to work. How much easier can it get? Not much, my friends. Not much. After work, we came home to this bubbling deliciousness I could smell the instant I walked in the door. Poor Nigel having to be home all day in such an amazing smelling house! First, I pulled the chicken out; slowly because it was so wonderfully fall off the bone tender. Then, while it cooled, I prepped the final pieces: the bean sprouts, jalapenos, limes, bok choy, basil, and rice noodles. Rice noodles… totally on our make from scratch list but I wanted pho waaayy sooner than it would have taken to learn to make rice noodles, so we ‘cheated.’ shhhh. and the rice noodles. These guys cooked in the covered Crock Pot for about 30 minutes on high. After the 30 minutes (ok, it was more like 22.5 minutes because I couldn’t wait any longer I was so excited), I added the shredded chicken back into the Crock Pot. And then we were in business. Dished out in some appropriately large pho bowls, with some bean sprouts, fresh sliced jalapenos, ripped basil, and a squeeze of a slice of lime. Seriously. Who doesn’t just love pho? I have yet to meet anyone who has had pho say “meh, I don’t really like pho” Which is probably a good thing because that’d be the last time I’d see them. I just don’t need that type of negativity in my life. Because really, how can you not love pho? And this pho is ridiculously easy which makes it even more loveable. It’s made in a crock pot! While you’re working or playing or doing anything else you want to do but be in the kitchen! How do you get better than that??? You don’t. I’m still full from all the pho I ate last night and dreaming of the beef pho I’m making next! Another one of my favorite Asian dishes made in your trusty crock pot, Crock Pot Chicken Chow Mein! Want to see more? Be sure to follow me on Facebook, Instagram, and Pinterest for more From Scratch recipes and inspiration! 6 oz of pho rice noodles, banh pho 1/16 inch is the best, but whatever you can find will work! Add brown sugar, fish sauce, cinnamon, star anise, ginger, and cloves to chicken stock. Place chicken breasts meat down in crockpot and then pour stock over. Let cook in crockpot for 8-10 hrs on low. Remove chicken breasts from crockpot and set aside. Remove spices from broth. Add bok choy to broth, turn crockpot to high and let cook for another 30 minutes. While bok choy cooks, shred chicken and slice jalapeños and prep sprouts, basil, and lime for garnishing. Just before bok choy is done, after about 20 minutes, add the rice noodles and shredded chicken back to broth to finish cooking for the last 10 minutes. Ladle into large bowls, add bean sprouts, jalapeños, basil, squeeze lime, and top with sriracha, chili paste, and/or hoisen to taste. 😛 Yes, please! Looks absolutely heavenly, Tracy…especially with that rich and flavorful homemade stock as your base. Excellent looking soup with wonderful flavors! I seriously thought I could smell this pho. Mouth watering deliciousness. Oh I’m still smelling it and waiting for the next batch! I think I can eat pho every day, but I always get beaf pho. I will try this recipe, looks delicious! This looks delicious, definitely one my husband would appreciate me making in the cold of winter. Thanks for sharing! Oh my goodness… I love your step-by-step photos… and the pho looks absolutely delicious! I’m craving it for dinner now! Thanks so much for bringing it to Fiesta Friday! This looks delicious! I feel as though I can just smell it through the screen :p I definitely need to get a crockpot! This recipe looks so light but with a great kick. Yum! Love it I really need to buy a crock pot. This looks too good. Oh crap on my cell it happens a lot, LOL! Ahhh hahaha I love you both and reading this thread! First I was like “What?! No crockpot? !” Then I was like, “Yea! What Angie said!” Then was like “ahh haha stupid auto-correct, but that’s hilarious,” and now I’m like, “mmmm wine, I think I’ll have some!” Ha! Thanks ladies! Pho in a crockpot?! Now you’re talking! This looks so yummy, I could definitely go for a big bowl right about now! I’ve never made stock from scratch before, I really should, is it hard? Thanks so much for bringing this along to Fiesta Friday! I just made my first pho a couple of weeks ago, but with pork. I spent three days on the stock. Now I am ready to try this chicken version which looks perfect. Thanks for posting. No place to get pho near you? How sad!! I hope you try it! The Star Anis looks beautiful in this soup. You’r amazing and make every recipe look so simple! I’ve never made Pho, but will now! Aw, thank you Renee! It’s much easy than I thought it would be, you should definitely try! I finally found a crock pot in Italy, so I will be making this recipe very soon. 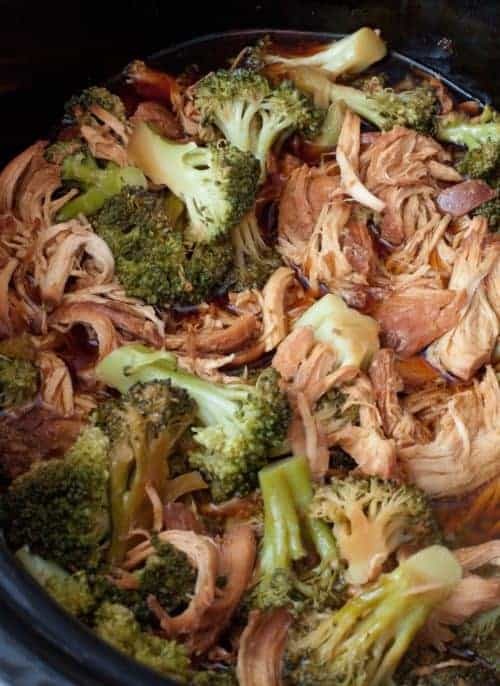 Dishes like this are my favourite thing to eat but never thought of doing them in a slow cooker, I may very well have to give it a try when we are off out on a jolly, the chicken would taste wonderful steeping for all that time! It’s amazing- I hope you do try it! I love crock pot meals. I must make this one! Looks so good! I need this in my life, it would help the cold that I am battling, pinning for later! I can’t wait to try this! I make some bone broth this week and now I have a good use for it. I recently made some chicken soup with an herbal loose tea that my friend sells and it had some of the same spices. I’m addicted to how much flavor they add. Pinning. I have pinned this recipe Tracy! I could eat pho everyday and crock pot pho is even more wonderful. I am sure to make this soon. Oh my, I think I am actually drooling. I’ve just started getting into slow cooking regularly and tried chicken last week for the first time, I was expecting it to just taste boiled but it was so tender. Since then I’ve been looking for more exciting recipes and this one fits the bill. Pinned and bookmarked! Though might try cheating and cook the whole chicken in the sauce rather then adding stock on then just the breast. I could eat pho for breakfast, lunch and dinner. It’s probably one of my favorite foods in the world. I’ve only made it on the stove top, so I’m really curious to give your crock pot version a try. Now to go and dust off my crock pot. Hey Ann! Oh my gosh me too – it’s one of my ultimate comfort foods! I hope you like it just as much as your stove top version! This is lovely! I really need to embrace my slow cooker! This looks amazing and I love a yummy bowl of pho! Nice! What are your thoughts on doubling this recipe? I have a family of 5 and live for left overs lol!!! I would love to try this, but I have a fish allergy. Any recommendations for substituting fish sauce? Our household loves pho but I’be always been too intimidated to try to make it. You made it easy and fabulous! A huge success. We loved every single drop. We live in Germany and great Asian food has been hard to find. No need to search for pho now! Thank you!!! Have you ever tried clarifying your broth? I always make broth with the Thanksgiving turkey carcass. I also make it more often. In my Better Homes and Gardens cookbook it says to mix one crushed egg shell, the raw egg white, and 1/4 cup water in a small bowl Add this to the strained broth. Bring to a boil. Remove from heat; let stand 5 min. Strain again with strainer lined with cheesecloth. I am always amazed that I end up with beautiful, clear, amber liquid. Please let me know if you try this. I haven’t, Lee but I LOVE this. I’m definitely going to try it with the next batch, thank you SO much!! I will update my Chicken Broth post with it when I do – thank you! Unable to print. 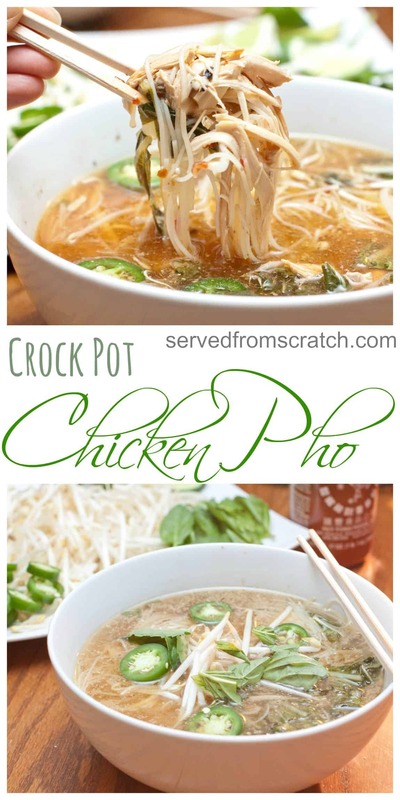 Crackpot Chicken Pho. What happened.???? Hmmm, I’m not sure, Edna. Maybe try refreshing the browser or trying a different browser? YUM! I love pho, have been wanting to make it at home for awhile but haven’t yet. Now I must! 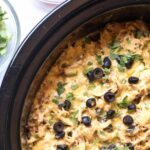 I love that this is so easy to make in the crock pot! I’ve never cooked with star anise before. This is a beautiful dish. It looks so light and clean. 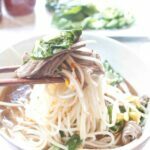 I’ve made chicken and beef pho in my slow cooker, it is just wonderful! This looks incredible, I’m drooling here! I love anything I can make in the crock pot, but even more so when it’s this delicious! This sounds great! I wonder if I could make this same recipe, but with pork? Do you think it would work? Looking forward to beef pho recipe. All was well up until the green mustard stuffs. No, just no. Also missing grilled ginger and onion. Your quantities are off between the step-by-step photos and the instructions. Also, your instructions at the bottom leave out what’s to be done with the ginger. YUM! Love everything about this. Pho is my fav soup — and this homemade version looks perfect! LOVE the step by step photos, this looks absolutely delicious! This is such a great recipe. Who needs take out when you can make food like this at home. The leftovers would be amazing too. Homemade is best, tastes delicious and save you money too. I’m addicted to pho and have been eating a bunch of chicken pho at restaurants lately. I’m so glad to have found you recipe so I can now easily make it at home! So happy to see you’ve made the stock from scratch! ? I can barely stand all that fresh yumminess in one bowl! All that green makes such an inviting dish. It can be hard to beat favorite restaurant flavors but it’s an amazing feeling when we come close! Is this pho real?!? Lol. I adore pho, and we finally got a really great pho place here, BUT– this sounds like a pho-nomenal idea! I neeeeeed!!! I love this easy Pho recipe. Noodle and brothy soups are definitely my weakness. Your step by step photos are very helpful so I am definitely saving this for later. Thanks for sharing your recipes. Shoot… It’s already 1:00 — too late to start making the pho for tonight… I’ll have to put the chicken back in the fridge and get this into the crock pot tomorrow morning… I have everything but the star anise (yes — even homemade stock, I just made), this looks and sounds so good. I can’t wait for dinner tomorrow night! I’ve been wanting to make chicken pho at home for so long now! This looks crazy delicious and quite easy. Can’t wait to give it a go! I love a good bowl of pho! I love that your recipe can be made right in the crockpot, makes it much easier for me to prep and forget. Thanks for sharing!! Considering there are no great pho places near my house (or any pho places), I think being able to make pho at home in my slow cooker is a win/win! And your pictures look so good. I’m hungry now! Could I use chicken thighs or legs instead of the breast meat? I really love dark meat in the slow cooker. This pho looks phenomenal. I love the amazing flavors, and yes, it makes a huge difference to use really quality broth and homemade is always the best. And I love that it can be made in a crockpot! 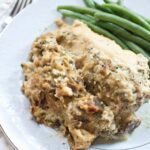 I definitely do not use my slow cooker often enough, and this recipe is such incentive for me to get it out! I absolutely love star anise. The aroma of this cooking must be incredible in the kitchen. What a great dinner for a chilly night! Fantastic idea to have the chicken all day in that aromatic broth. I do love a good slow cooker meal, to come home too. i also want a bowl of this right now for the cold London weather. You just mean 10 star anise pegs/segments. I only used one whole star and that was enough flavor for me. I found the spices to be nice and “warming” but almost too strong. I would probably use a small cinnamon stick and half as many cloves. Delicious, otherwise! Thank you for the recipe! Can this recipe be done on the high setting?? How long would it take to finish?? Hi Nicole! Yup! I’d do it on high for 4 hrs. Enjoy! Delicious!! I used store bought stock, so next time I’ll use less anise. But I cannot wait to make this again!! Thank you. Approximately how many servings does this make? I made this today and it was amazing. Just like going to get it at a restaurant.! That’s great to hear Deb!! So glad you enjoyed it. Made this today, it was so good and a perfect way to celebrate a relaxed New Year! Great Pho recipe. I can’t wait to try this and have my house smell so good from all the spices. Pho is one of my husband’s favorite dishes. I totally need to make this for him, thanks! I adore my slow cooker and I’m always on the lookout for new recipes to try in it. Thanks for sharing this. My mouth started watering before I even finished reading the title! This looks so amazing! I love making recipes from scratch and this one looks so delicious! Thank you for sharing! From scratch is the best – thank you! Homemade stock for homemade pho is the stuff of dreams. It looks and sounds amazing! I love soups so every time I see recipes like this I want to try it. I’m definitely gonna try this on the weekend. Thank you so much! Great looking pho! I can smell it through my screen! 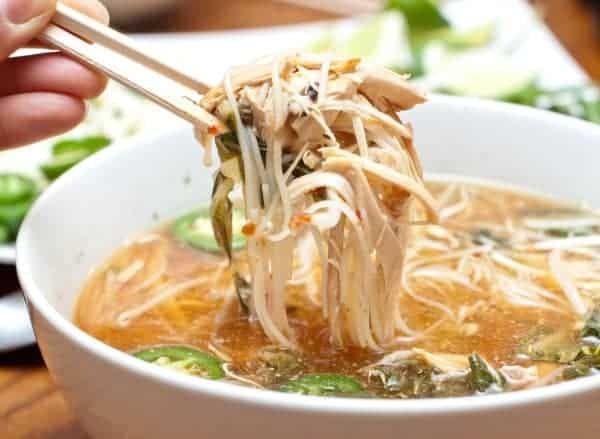 I have been looking for soups that I can make for my grandmother, and this pho looks so good and easy for her to consume and digest. Thank you for sharing this awesome recipe, Tracy! Thank you, Yang! I hope you and your grandmother enjoy it! Crock pot dishes are the best! Id like to add a little more ginger to this for its known health benefits. I hope the taste wont be as strong. So want to try this dish for this week but have questions on what I can use (from pantry) and what is a non-negotiable change. Forgive me for my non-culinary knowledge. I have Udon noodles already but concerned a Japanese noodle won’t work with with the Vietnamese dish. Should I still use them? Second I only bought 3 star anise vs. the 10 because of sticker shock ($178 each) and didn’t have the recipe on me. Is that too little quantity? Where should I order them from because of their $$$ price? Lastly, how long do cinnimon sticks stay good for? I have some from a couple of years back. Should I toss or use? Hi Johana! Great questions! Udon noodles are a much thicker noodle and made of wheat and not rice. You can use them – but they’ll take longer to cook and also will taste different, but probably still good! They will soak up a LOT more broth though, so you’ll end up with less broth. I hope you meant $1.78 each! But even still that’s super expensive! You can find them on Amazon for muccchhh less. The anise definitely adds a lot of the flavor, but sometimes people find it strong so maybe you’ll like it with just the three! For the cinnamon, I’d still use them! In the stick form (not ground) they last a lot longer. I hope this helps!